As a 30+ year old gamer, I find myself slowly becoming the grouchy old man on the porch. I spend my days in my rocking chair, watching these newfangled games come and go at warp speed. Some of them may catch my attention, but most of them draw my ire. Younger gamers may wonder what the problem is, and they are well within their right to do so. What upsets me is the fact that it’s almost impossible to explain the greatness of yesteryear’s titles due to graphics that aged poorly. One fact will always remain true though. Excellent game design will always shine. New ‘n’ Tasty is a picture perfect example. New ‘n’ Tasty follows the adventures of Abe, an employee at Rapture Farms. Abe mistakenly stumbles onto a plot to eradicate his people and quickly springs into action, trying to escape his surroundings and rescue as many of his Mudokon brethren as he can. The story is pretty straightforward, yet it packs a lot of humor and charm. This title was rebuilt from the ground up, and it really shows. Seeing this world with updated visuals shows you just how ahead of its time it was. You can’t tell for a second this game was originally made in 1997. The biggest change from the original is the screens are no longer static. 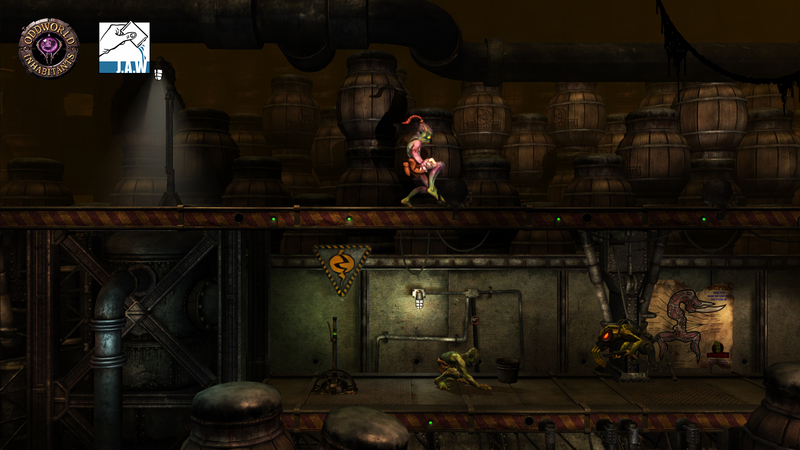 In Abe’s Oddysee, you moved from screen to screen. The game is now presented in real time 3D, so it has become a true sidescroller. It’s the biggest reason the game feels modern, and it was a great decision. This also allowed for a more dynamic camera, and Just Add Water used it to great effect here. Everything jumps off the screen in a way it was impossible to do back then. Great visuals mean nothing if the game play doesn’t work. The core game play has been mostly unchanged. Abe isn’t an action hero, so you will do more avoiding and running than anything. Abe CAN possess enemies and have them do his bidding though. Abe must deal with the combination of enemies who are much stronger than him, and a heap of environmental hazards. The levels are cleverly designed, allowing for multiple solutions as to how to proceed. That doesn’t mean it will be smooth sailing though. Quite the contrary. You will die, and die, and die. There is a quick save feature available with a press of the touch pad, so death isn’t nearly as frustrating as it was in the original. I suspect die hard fans will cry foul, as no such feature was available in Abe’s Oddysee. With unlimited lives, each death is really just an excuse to try a different approach. I never felt frustrated while playing, even when dying multiple times in one spot. There are 2 different endings depending on how many Mudokons you save, and your time is tracked for speed runs. There’s even a trophy tied to one. The updated controls may frustrate fans of the original, but they suited me just fine. The original pre-dated the Dual Shock, so the shoulder buttons were used to determine if Abe would run or walk. The left analog stick takes care of all that now, although sometimes it will cause you to overshoot a spot when you can’t afford to. Abe still uses Gamespeak to order the Mudokons around, and there is a bit more variety in the responses you will receive. You can now aim thrown objects with the right analog stick, which is a very welcome addition. Tip Toe’n In My…..Never mind. New ‘n’ Tasty was created with a lot of care and careful thought. Just Add Water kept everything that made the original adventure so special, while modernizing some of the aspects that made it feel dated. The more forgiving difficulty curve will help newcomers enjoy the adventure as well. This game goes to show that when the heart and soul of a game are crafted with a high quality, it can stand the test of time. Abe’s Oddysee didn’t need any new modes, online multiplayer, or any other staples of present games. All it took for New ‘n’ Tasty to earn a seat at the table in 2014 was a makeover. Deep down, it’s still the same Abe we have grown to love over the years. Just newer. And tastier. July 30, 2014 in Reviews.